Struggling to contain an escalating crisis at Kabul Bank, Afghan authorities have barred the sale of Kabul properties held by the bank's principal owners. But the freeze excludes President Hamid Karzai's brother, Kabul Bank's third largest shareholder, who says he does not own property in the Afghan capital. The Afghan Central Bank ordered the property-sale ban in a letter reviewed by The Washington Post. It was sent to Kabul municipal authorities and it targets five people, including Kabul Bank's two biggest shareholders - who were ousted last Monday as executives of the bank - as well as the brother of Afghanistan's vice president, who is both a shareholder and major borrower. No restrictions were placed on the president's own brother, Mahmoud Karzai, who has also borrowed money from Kabul Bank, including $6 million that he used to buy a 7 percent stake in the crumbling bank. "They couldn't freeze my property because I don't have it," Mahmoud Karzai said in a telephone interview from Kabul. "I don't have a single house or parcel of land in my name in Afghanistan." Afghans frequently register their assets in the names of relatives or trusted friends. Critics of the Karzai family allege that Mahmoud has done this, but others dismiss such claims as a politically motivated smear. Mahmoud Karzai holds a stake in an Afghan cement factory and is involved in a Kandahar property development, but when in Kabul, he stays in a rented property. He spends much of his time in Dubai, where he lives in a luxury villa purchased for $5.5 million with Kabul Bank funds. His principal asset, he said, is a house in Maryland, which he rents out. The move to block asset sales comes as Afghan authorities struggle to hold the nation's largest bank together against waves of depositors demanding their money back. Amid reports that bank funds have been stolen in several cities, authorities want to try to stop bank insiders from selling assets purchased with loans that haven't been repaid. The disarray at Kabul Bank, which still has more than 1 million customers and handles salary payments for soldiers, police and teachers, flows from a tangle of murky loans by shareholders to themselves and from risky investments in Dubai real estate. With so many Afghans' savings, salaries and political fortunes at stake, what began as a financial mess has morphed into a serious challenge to the credibility of President Karzai and his American backers. What a tangled web, got to love borrowing the money from the bank to buy shares in the bank! Genius. Still at least they invested wisely in property, the investment that cannot fail to deliver. If I am a bank and lend money to myself, say, a million, do I then have an asset of one million on the books (the loan) and one million cash at hand? Does this increase the apparent profitability of the bank, and most importantly, do I get a bonus? Surely for just thinking that you'd get a bonus? Not sure where I read it, or saw it now, but most/all the dollars the US poured into Iraq ended up financing Dubai. I suppose its not different to the Brinks Matt bullion robbery financing Canary Wharf (allegedly). Afghanistan's central bank has said it is prepared to offer loans to the troubled Kabul Bank. Customers have been queuing to withdraw their money at branches of the country's largest private bank for several days as fears have grown about its stability. 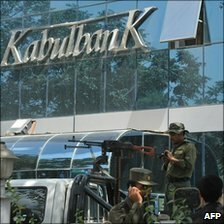 Kabul Bank has been the subject of reports alleging large-scale corruption by executives. Armed police were stationed at branches on Sunday to keep order. Drat, drat and double drat! Foiled again, Mutley! Seriously though, I'm surprised this news is not of more interest. IMHO, the US really can't afford for this bank to fail. 1. Bank recovers from corruption and investments in Dubai etc. Problem over. 2. Bank collapses. Troops, police and government workers not paid. Savings gone. 3. US steps in to recapitalise / stand behind bank. UK banks are doing something very similar to this with their Shell Firms buying the possessed homes from defaulters. It works like this...100k loan..defaulted....sell home and collect cash...say £100k....the bank now has no loan and no asset...it is cancelled and they need to sell another loan. OR, give 100K to shell, shell buys house..and bank gets 100K...the loan in now cancelled, and the bank have a 100K ASSET in the form of the shell...which being a shell, has nothing. the 100K came from BoE bail out. Turning nasty now. This sounds like a proper run. KABUL -- Fears over the future of ailing Kabul Bank grew violent Wednesday as state police beat back crowds of frustrated Afghan government workers attempting to withdraw their salaries on the final day before a four-day national holiday. Sharia banking no better than our own then? Aug. 19 (Bloomberg) -- Afghanistan plans to issue licenses for three Islamic banks, the first to offer a range of services that comply with religious law in a country where 99 percent of the population is Muslim. Afghanistan's central bank has stepped in to take control of the troubled Kabul Bank, its governor said, after suspected irregularities raised concerns over the country's top private financial institution. The central bank's governor, Abdul Qadir Fitrat, said investigations had also started into the dealings of the bank's top two directors and shareholders, who were told to resign, and a brother of the Afghan First Vice-President, Mohammad Qasim Fahim. Kabul Bank's troubles have threatened to add a financial crisis to Afghanistan's other woes, ahead of parliamentary elections on 18 September. You can hide, but you can't run forever. The Afghan government will struggle to pay its bills "within a month" after the International Monetary Fund rejected proposals for resolving the Kabul Bank scandal, western officials have warned. Although the war-torn country's biggest bank nearly collapsed last September, the government of Hamid Karzai and the international community are still at loggerheads over plans to fund an $820m (£507m) bailout as well as how the disgraced former managers and shareholders who helped themselves to hundreds of millions of dollars should be prosecuted. Two senior western officials said the government will face a cash crisis in the coming weeks and could struggle to pay staff bills, although one predicted this would be avoided by cutting other spending priorities. If you click on the link, the Guardian is a bit more sensationalist than me! Don't forget you now have a million so you could fractionally lend say 100 million to debt ridden masses! Bang goes my poppy money!